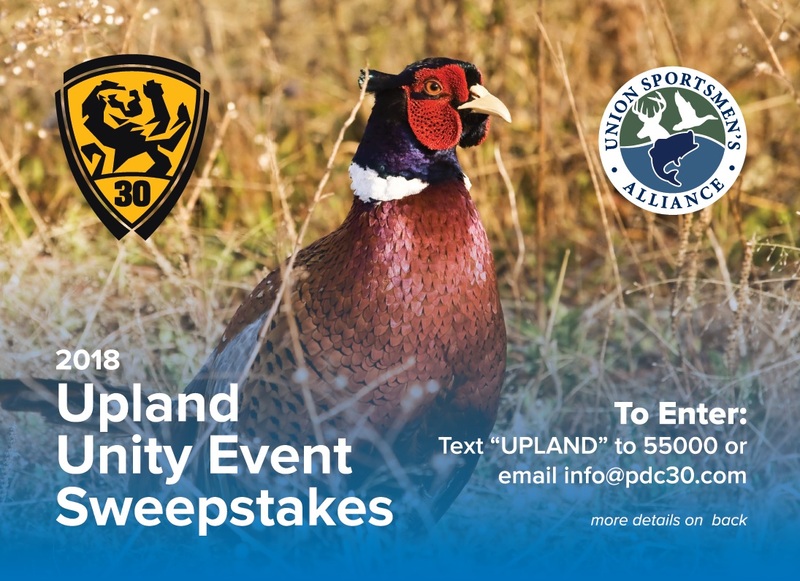 Enter now to win an upland hunt experience on Sunday, December 30, 2018! Sweepstakes entries will be accepted 10/29/18 – 11/30/18. Winners will be selected at random and announced on December 10, 2018. The winning members will participate in an all-expense paid upland hunt on Sunday, December 30, 2018. Please call the District Council for additional information. To enter, text "UPLAND" to 55000, call 630.377.2120, or email info@pdc30.com. Summary Terms & Conditions: Our mobile text messages are intended for subscribers over the age of 17 and are delivered via USA short code 55000 and 76000. You may receive up to 1 message(s) per month for text alerts. Message and data rates may apply. This service is available to persons with text-capable phones subscribing to carriers including AT&T, Verizon Wireless, T-Mobile®, Sprint, Virgin Mobile USA, Cincinnati Bell, Centennial Wireless, Unicel, U.S. Cellular®, and Boost. For help, text HELP to 55000, email MRICHARDS@PAINTERSDC30.COM, or call +1 6303772120. You may stop your mobile subscription at any time by text messaging STOP to short code 55000.